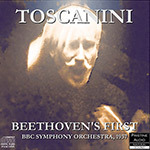 Toscanini's visits to London to conduct the BBC Symphony Orchestra proved highly fruitful. The orchestra had developed into one of the finest in the world, and responded brilliantly to the direction of maestro Toscanini, both in this recording of the 1st Symphony, and also in their 1939 recording of Beethoven's Fourth Symphony, PASC065. The recording here, one of the first to benefit from the Pristine Audio Natural Sound technique for correcting the equalisation of 78rpm recordings, was taken from a rather swishy set of British HMV pressings. This swish generally comes from defects in the original recording masters - however I did find that the re-equalisation initially exaggerated it, and further attention was required to 'tame' it. The rather reverberant hall acoustics can also be more clearly heard.